From coast to coast, I think most people are finding the weather patterns this spring to be fickle, to say the least. California is a little more temperate than the east coast, but we have had a lot of back and forth from hot, summer-like weather to cooler, rainy weather, which again is better than a few feet of snow in the middle of April. The springlike floral photos below were taken last weekend and within the 15 minute time span of taking the photos, the weather fluctuated between being extremely sunny to dark and overcast. This alternated several times, ultimately culminating in a huge rain storm. Much like the weather, my attitude towards this skirt was also somewhat fickle. I loved the floral pattern and the vibrant colors, but I hesitated about buying yet another floral skirt. I also wanted to get it for the lowest price possible, so I debated between buying it online or in-store at J. Crew. I finally bit the bullet and went through with the purchase in-store. I am glad that I did, because I am finding it to be a very versatile piece in my wardrobe, although perhaps not the best article of clothing to wear on a rainy day! Another gorgeous look! I love the floral skirt with the coral top! I love the whole outfit and that fabulous necklace! You always have a great interesting mix of colours in your outfits that I adore. I love a good floral skirt and yours is cute. I love how you styled it! Fickle pretty much sums up spring weather around here too, although we've been lucky to have mostly nice days. 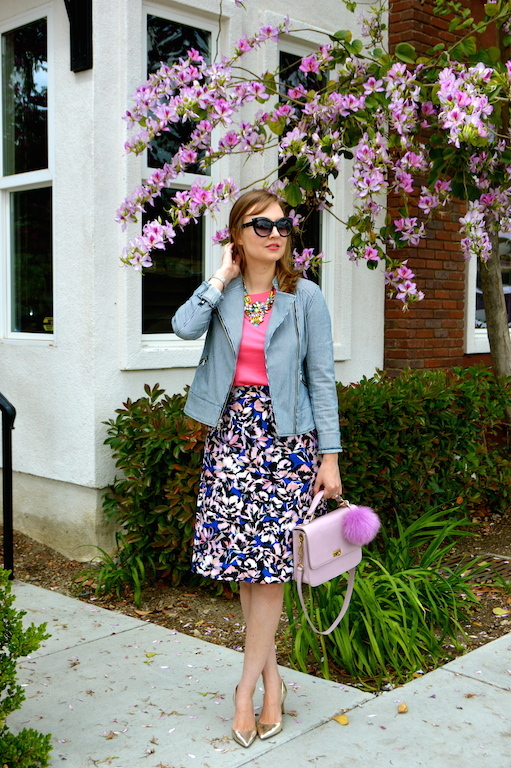 I think that skirt was a great buy too--it's so pretty with the bright pink top! That jacket too... love that. I have been on the fence about this skirt. As much I love the print and color, I am reluctant on the slight a-line which is not very flattering for me. I haven't tried it on but I am so tempted at the sale price. Love how you styled it!